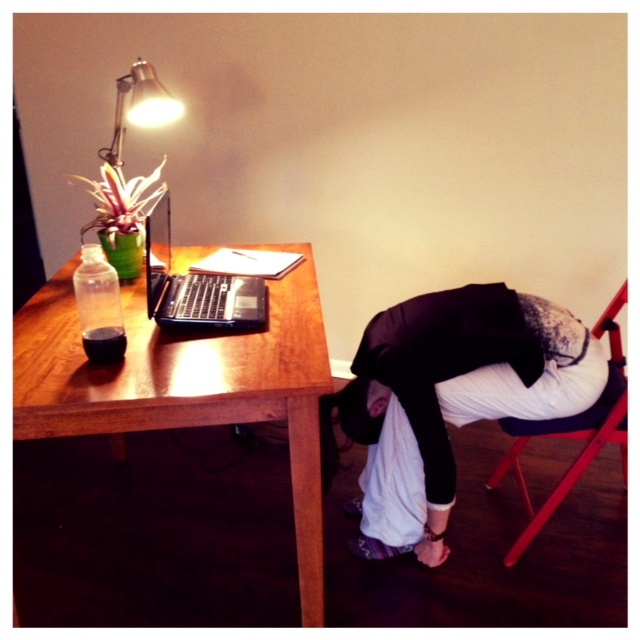 Feeling tired at work? Unmotivated? Stiff? Lacking good posture? 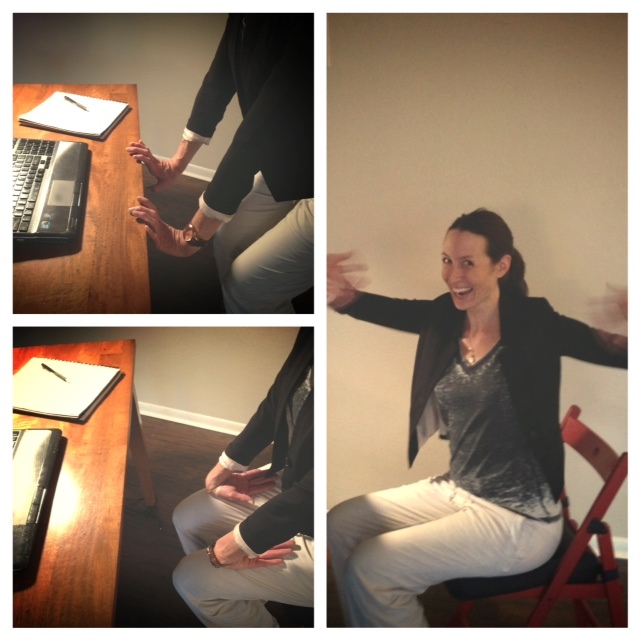 Desk stretches are the perfect mini-breaks to sprinkle through your day. Try these desk stretches to get you feeling energized, focused and clear. 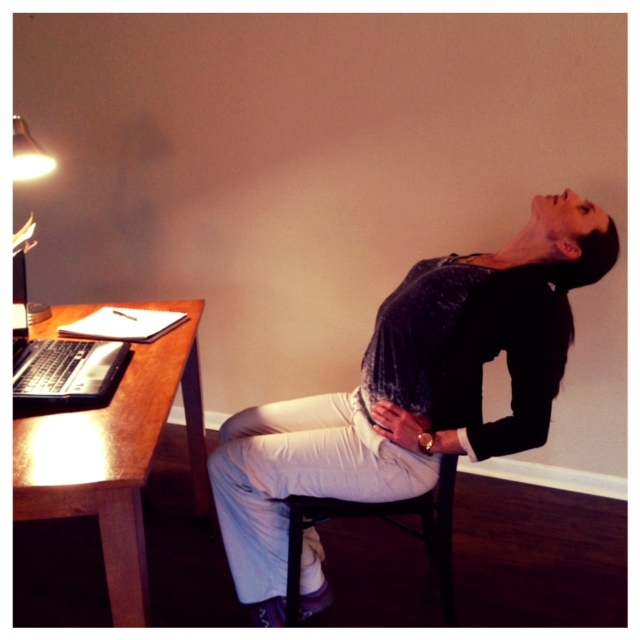 The Neck Stretch: Sit up tall in your chair and slide your right hand, palm down, under your right buttocks. Let your left ear hang towards your left shoulder and release your left arm towards the ground. In this desk stretch you can play with the positioning of your chin (in towards your chest, up towards the sky) to get at different parts of your neck. Explore what’s right for you. 5-10 deep breaths, then switch sides. Desk Cat/Cow: Push your chair back about a foot from the desk. Place your hands on the desk and have both feet rooted to the ground. On the inhale, arch through your spine lifting your chin towards the sky. 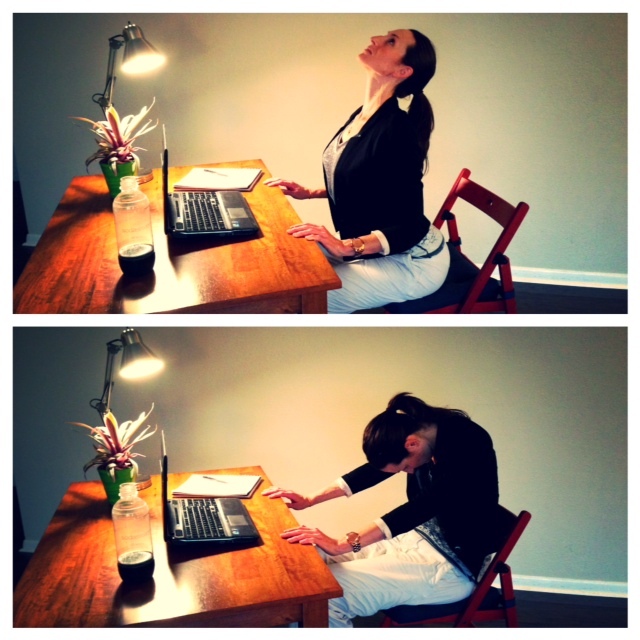 Energetically pull on the desk to allow for more length through your spine. On your exhale, press the hands down on the desk as you round the upper back towards the sky and tuck your chin in to your chest. During this desk stretch synchronize your movement with your breath. Inhale, arch and lift your spine. Exhale, round and tuck. Repeat 5-10 times with long deep breaths. Wring out the Wrists: Stand up. Place your fingertips on the edge of the desk and allow your wrists to draw towards the floor (this may mean bending your knees or leaning into the desk). Do this for 3-5 deep breaths. Next, place the backs of your hands on top of your thighs with the fingers facing up. Draw your arms closer to your body as you stretch the tops of your wrists. Do this for 3-5 deep breaths. To finish this desk stretch, shake out your hands vigorously! Keep shaking, it’s moving useful fluid into your joints! Do this for 30-45 seconds, then release your hands. 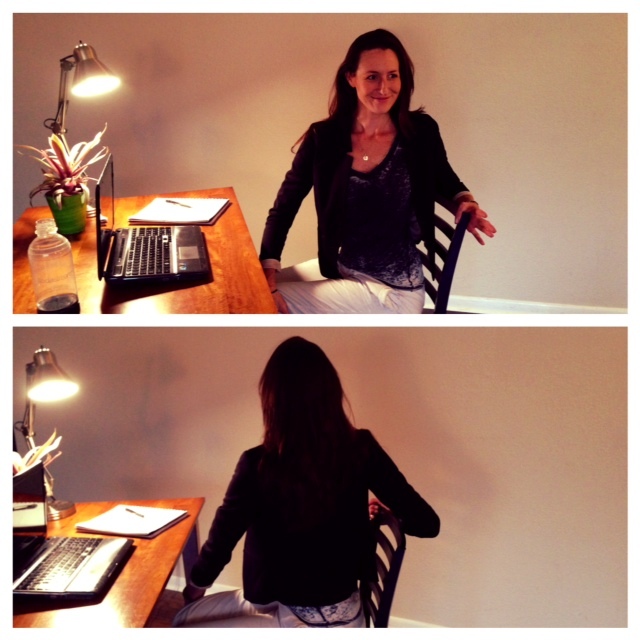 Forward Fold: Sit up tall in your chair, with the chair 2-3 feet back from the desk, or turned to the side. Feet plant hip distance apart, arms rest by your side. Reach your chest forward beyond your knees, resting your torso on your thighs (or as close as you get) and releasing your head and neck. For a more intense version of this desk stretch, widen the legs and release your torso between your legs as far as feels comfortable. For an even more intense version of this desk stretch, stand up and move to a wall. With your heels and buttocks as close to the wall as possible, reach the chest forward as you release the head, neck and torso towards the ground in a forward fold. 3-5 deep breaths in whatever version is right for you. Backbend: Sit up as tall as you can in your chair. This backbend can vary based on height, so notice if it helps to sit up on a pillow or a book (or two!). Ideally, the bottom of your shoulder blades are at the top of the chair. Hold on to the sides of the chair, or place hands on hips as you extend the spine long and bend back over the top of the chair. Be mindful to keep your low belly strong during this desk stretch to protect your lower back. Notice if it feels okay to release the neck, or if it feels more supportive to keep the neck engaged. If this desk stretch doesn’t feel quite right, you can always stand up and find a standing back bend by engaging through the core, and then lifting and lengthening from the upper portion of the spine. 3-5 breaths at a time, repeat 3 times (or more for extra energy). Seated Twist: Sit up tall in your chair, finding as much length in your spine as you can. Twist to the right first, placing your left hand on the outside of your right knee. You can bring the right hand to the back of the chair and press gently into both hands to get even deeper in the twist. Stay for 3-5 breaths, and then switch to the other side. Taking just a few minutes to breath and move the body in a desk stretch can reset your workday and reboot your whole system! 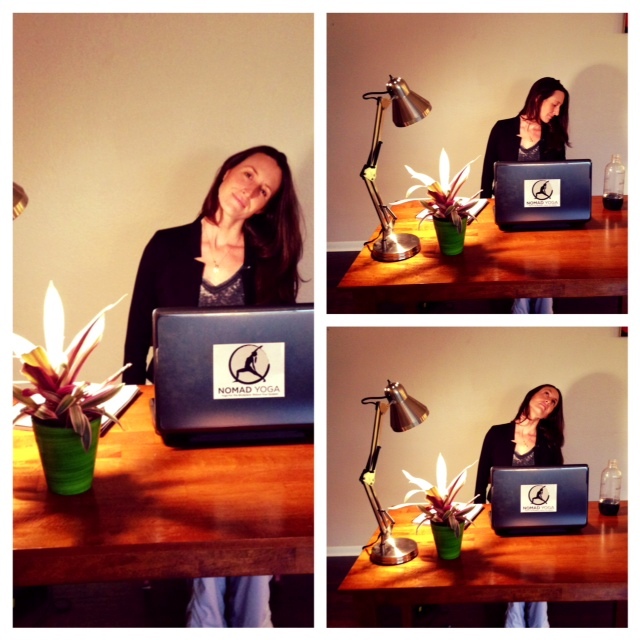 Let us know how it goes, and if you have a favorite desk stretch to add to the list! Where to Practice in Denver: Find the Denver Yoga Studio For You! don’t forget to check out the fantastic boutique! for everyone at this wonderful studio, including a free week to see what it’s all about, free community classes to keep it going, and an entirely donation-based studio! This Denver yoga studio does a great job of making yoga accessible to all. basement feel cozy and calming. not cover their athletic needs. instructors during your free week! soon as you walk through the doors. schedule to make sure class times will work for you! network and motivational community. 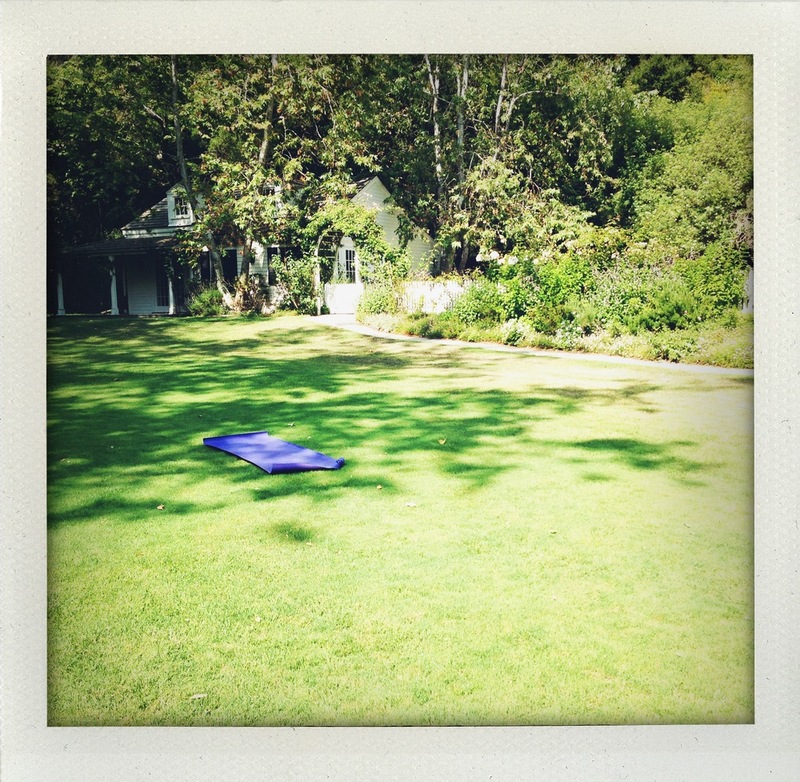 And note, 90% of the work is getting onto your mat! Enjoy! Make Peace With Where You Are NOW. Sometimes goals can be another way of saying “If I get X, then I will feel Y” For instance, if I become successful, then I’ll finally be happy. Find the peace now. Once you’re goal doesn’t carry the weight of who you could be, it gets to be an adventure! And adventures are fun! With twists and turns and unexpected moments that add to the experience rather than take away from it. Be Flexible With the Direction. We always want a direct route to exactly what we want. But break down the essence of what it is you want– want a relationship? The essence is love. Allow the direction to flow easily towards the essence, allow surprises to delight you, and allow yourself to zig and zag without feeling lost or off-path. Turns out, you’re always on the path. Celebrate Small Successes. We usually remember to celebrate the big deals. But what about the “small” deals? Share successes with friends! Toast with champagne! Smile big! Live in each moment. Enjoy each step on the path the same way you will enjoy reaching the big goal. Keep Reminders and Notes of Encouragement Around. Post-it notes full of love and support. Outlook reminders to check in with smaller goals. Inspirational quotations on your bathroom mirror or computer screen. Keep images of your goal next to your bed, so the first thing you seek when you wake-up and fall asleep is your dream. Visioning and believing that you will achieve your goal has a powerful impact on success. Let your dream be an active part of your life now. Once a Week Sit & Imagine. This is actually great to do every day, before you start your day. But at least once a week, sit and imagine what it feels like to be there. Really feel it. Live in it, for at least 5 minutes at a time. Practice being there. This keeps the dream alive as you move towards it, and keeps you present in this moment with contentment. Remember that happiness is not a product of anything. It is inside of you regardless of how chaotic the external circumstances of life seem. Stay focused on your dreams, but don’t get lost in them. Dreams don’t come true someday, they can only come true now. So pay attention!